Though I use Captcha and reCaptcha, I have a lot of dummy users and Contacts which I can identify by the fact that their sort_name = display_name = email (or sort_name contains an "@"). How can I delete those Users and Contacts ? My original idea was to create a Dynamic Group of those, then delete them after exporting their list to excel to delete the relevant Users. But, how to create such a Dynamic Group (based on what search criteria ?) ? An alternative would be to create a View (filtered on "sort_name contains '@'"), then use VBO to add them to a Group : I tried, but could not succeed). 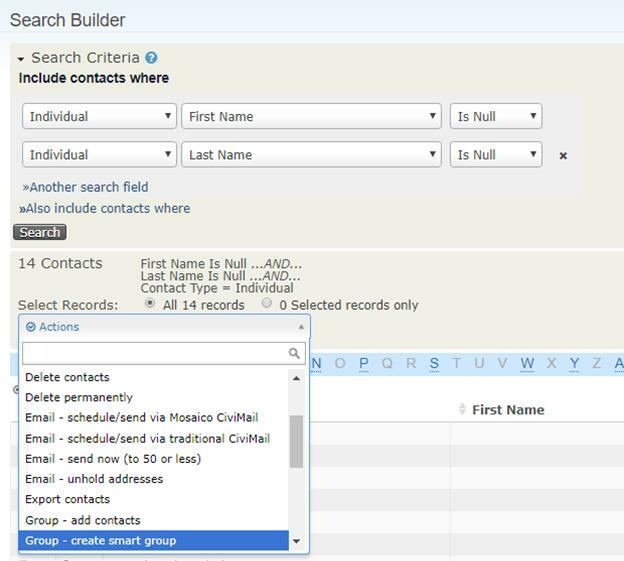 You could use Search > Search Builder and search for Individuals whose First Name and Last Name are NULL (when this is the case, Civi will use the email address as the Display Name), select all of the search results and then create a Smart Group. You would then periodically review the contacts of the smart group by navigating to Contacts > Manage Groups and then clicking on the Contacts hyperlink to the right-hand side of the group and perform the desired actions. Not the answer you're looking for? Browse other questions tagged contacts user-account search-builder or ask your own question. How Do You Create Users from Contacts? How to have the Civi Contact deleted when the Drupal User is cancelled? How to delete addresses (and only addresses) for multiple contacts? How to share the user profiles with other users?